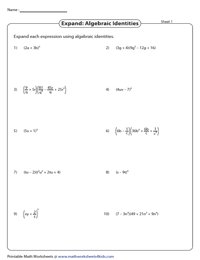 Employ this batch of worksheets to enhance your skills in applying algebraic identities to expand algebraic expressions. Each section offers two levels of difficulty other than cubic expressions. Expand the algebraic expressions in the standard form (a+b)2, (a-b)2, (a+b) (a-b), (x+a) (x+b), (a+b+c)2, quadratic expressions, cubic expressions and much more. Expand the algebraic expressions involving single and multivariables by using either (a+b)2 or (a-b)2. 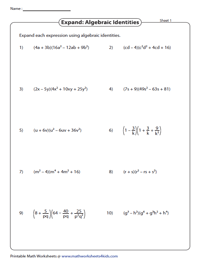 This batch of worksheets represents algebraic expressions as a product of two binomials. Apply the formula (a+b) (a-b) = a2 - b2, to expand each algebraic expression. Use our resources for extensive practice to determine the product of two binomials, whose first terms are same and second terms are different. Compare the expression with the identity (x+a) (x+b) = x2 + (a+b) x + ab to expand the given algebraic expression. 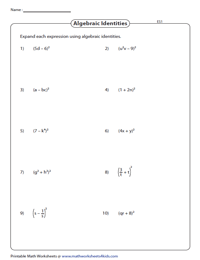 Give your students a jump start on the expansion of the square of a trinomial with these printable worksheets. Build up the skills in applying the identity (a+b+c)2 = a2 + b2 + c2 + 2 (ab + bc + ca) to expand the expressions. 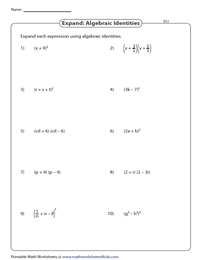 Strengthen your algebraic skills in using the identities (a+b)3 and (a-b)3 to expand the set of algebraic expressions enclosed in these amazing series of worksheets. 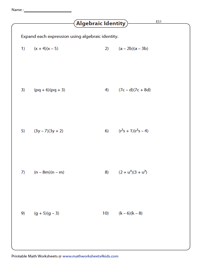 Algebraic expressions featured in this compilation of worksheets are in the form (a+b) (a2 - ab + b2) and (a-b) (a2 + ab + b2). Apply the sum of cubes or difference of cubes identity to determine the product. 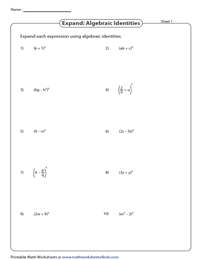 These algebra worksheets feature algebraic expressions in the form of square identities. Look at the expression and apply suitable identity to expand the expression. 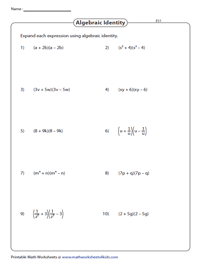 Explore this batch of challenging worksheets to learn how to apply cube identities to expand the algebraic expressions. 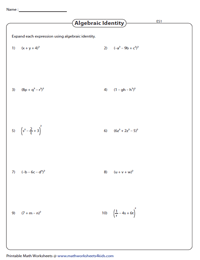 It provides students with a good foundation in learning algebraic identities.